Assault Courses and Obstacle Courses are good physical challenges that foster teamwork, but only if the obstacle course is designed well. These ideas show how to make your own obstacle course, as well as giving information on organised team obstacle course races such as the popular Tough Mudder or Spartan Run. What is the Point of Team Building Using Obstacle Courses? The basis of an obstacle course is to create a physical challenge where you have to use strength, agility and often brains to get past the obstacles in your path. Sometimes competing against the clock, sometimes as a team, obstacle courses come in many forms. They range from the sack races at a school sports day, to something big like Total Wipeout on the TV. The military use assault courses to test the ability and endurance of personnel. Army assault courses have gained notoriety with the public, especially the Royal Marines assault course with its notorious Sheep Dip, and consequently events such as the Tough Mudder, and the Dirty Dash have become great events to take part in. 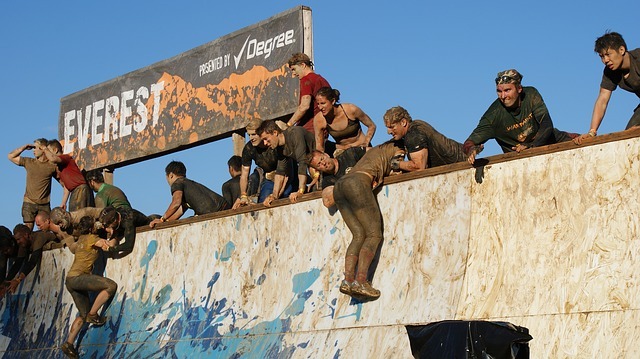 Obstacle course races such as the Tough Mudder have events organised all over the world. Every obstacle course race has a new type of obstacle created that will encourage obstacle course race teams to enter. Fire, water, mud, crawling under barbed wire, swimming and lots of thoroughly exhausting challenges await you. You will need to train hard to be in with a chance to successfully complete the Tough Mudder or Spartan Run. Some competitors are so dedicated they even have special Tough Mudder running clothing. Basically, you want to be wearing something that will cope with lots of wet mud and freezing cold temperatures. Every year, the Royal Marines open up the Royal Marine training course at Woodbury Common, Exeter in Devon to anyone over 16. In early October, there is the 4km fun run through the obstacles on the Royal Marine Training Course. This includes the infamous Sheep Dip, where you go fully submerged through a muddy tunnel full of water. There is also the 10km Marine Challenge, which still has the obstacles, but includes road runs. 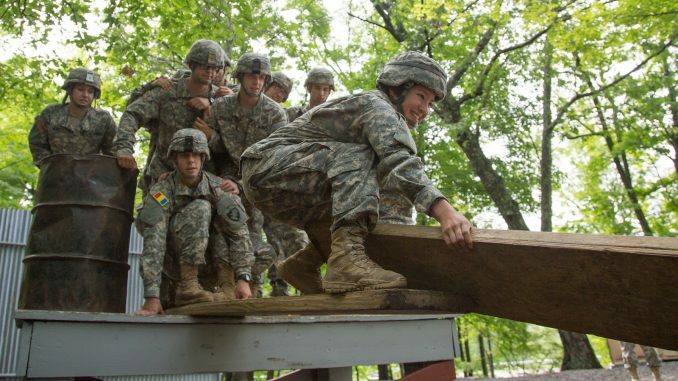 An obstacle course is a challenging outdoor personal development and team building activity which usually consists of high and or low elements. Low elements take place on the ground or only a few feet above the ground. And yes, you guessed it high elements can be constructed in trees and require a belay for safety. Depending on your own skill, qualifications and experience, you can be quite adventurous with the obstacle course you create. If you are going to include some higher elements, you will need to consider whether climbing harnesses and belay equipment is needed. Safety first. Belay systems are used to secure climbers on the higher parts of the course as you move through the course. This means that you have to explore the fundamentals of trust, craftsmanship, and coaching. The lower parts of the course are most often designed to explore group interaction, problem-solving, and leadership. For the most part, you can create some great obstacles on the ground. Tyres spread on the ground to hop from one to the next, tunnels, poles to jump over or crawl under. Planks can be used to walk along. One simple yet challenging obstacle course I set up is the bucket on the rope. You string a series of ropes around a course that goes under nets, through bushes and up trees. The team then has to insert the end of the rope through the handle of a bucket full of water. They team then has to move the bucket along the length of the rope as quickly as possible without spilling any of the water. Good teamwork is needed to get the bucket through the branches of the tree, possible needing a human tower to reach. It is simple but very effective. If it is summer, a water slide is usually a great way to end. You will need a long sheet of tarpaulin, a slight slope, and some way of keeping the tarp wet. Usually, you can do this with a hosepipe. Slack lines are very cheap to buy and are a brilliant obstacle that will test everyone. You set them up as a low rope not far off the ground. They are particularly challenging to cross, but this means that good teamwork is needed. You can even use them blindfolded as long as you have two other members of the team holding the slackline walker’s hands. Perfect for trust building, motivation and communication. Modern adventure courses meet a number of educational, developmental, and recreational goals by focusing on personal achievements and ask participants to confront their personal fears and anxieties. Challenges are usually physical and or emotional – although not too emotional I hope! If you don’t have the resources or time to create your own obstacle course and want to try one, then why not pay a visit to one of the many outdoor obstacle courses around the world. You can find them at adventure camps, Go Ape Treetop Adventures in the UK and US, or for those who love a challenge, you can enter an obstacle course race like Tough Mudder.